What’s the best way to crack an egg? How physics can help you when you’re making your next soufflé. How physics can help you when you’re making your next soufflé. How do you crack an egg? 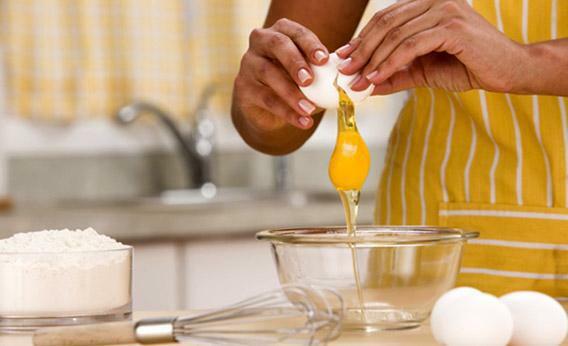 This is the classic one-handed egg-cracking technique favored by chefs, if only for its virtue as a time-saver, given the large number of eggs the average Parisian chef must crack on a given day. (The French do love their soufflés.) But opening an eggshell between the fingers and thumb of one hand requires precision and practice, and most neophytes, like Sabrina, end up with a hand full of crushed egg. Fortunately, there are alternative methods that get the job done perfectly well. My mother taught me to crack the egg on the rim of the mixing bowl before gently pulling the two halves apart with both hands, while my husband prefers to tap the eggshell gently with the dull edge of a knife. Others might favor striking the egg against the edge, or the surface, of a countertop. If a recipe calls for egg whites—a nice fluffy meringue, for example, or a vintage whiskey sour—extra precision is needed in whatever technique you choose: Ideally, you want two equal halves of the shell so you can pour the yolk back and forth from one half to the other, letting the egg white run off into the bowl. All these methods have one thing in common: They rely on applying just enough force to the center of the egg—the egg equator, if you will—to crack the shell without shattering it. And science has finally come up with an explanation for what comes naturally to most home cooks: Eggs crack best around their equators, says MIT mechanical engineer Pedro Reis, because of their geometry. He and a young colleague, Arnaud Lazarus, have just published a paper in Physical Review Letters demonstrating a link between an eggshell’s geometry (it belongs to a class of shapes known as ovoids) and a mechanical property called rigidity—the quality that, along with strength, determines how much force an object can withstand before it cracks. Scientifically, strength and rigidity are distinct, though related, concepts: The shape of an eggshell can determine its rigidity without affecting its strength. Reis explains the distinction by pointing out the difference between two eggshells, one of which is unbroken, and the other of which has tiny cracks in the shell. The two eggshells have the same rigidity, but the latter has less strength, because it breaks under less applied force than the egg with no cracks. Reis’ and Lazarus’ model is a mathematical formula that predicts what will happen when you poke thin, shell-like structures at specific points. That is essentially what it takes to crack an egg: a sharp, targeted strike at the specific point where the egg’s structure is weakest. The shell has a threshold beyond which it can’t absorb any more force, and once that threshold is crossed, the shell will crack. Reis became interested in studying eggshells after successfully walking on a few cartons of eggs without breaking them, a popular party trick among the geekerati. “I didn’t believe it until the first time I did it, but you can actually stand on a carton of eggs,” he said. The key is to align the eggs so that the narrow pole is pointing upward, and step in such a way to distribute your weight over the entire surface area, to avoid overloading any one eggshell. (It helps to go barefoot, Reis says.) Usually, it takes a little more than 5½ pounds of force to crack an eggshell—much less than the weight of a human being—but the precise amount of force needed depends on the direction in which that force is applied and how much the force is distributed (or not) over the surface of the shell. If you take an egg, hold it between your thumb and middle finger by either pole (the tip and bottom of the egg), and press down hard, it is unlikely to crack. Your thumb and middle finger can’t exert sufficient force to bring the shell to a breaking point. Even if you press against each pole with both hands, as hard as you can, chances are you won’t be able to crack the egg. It has very high rigidity, or stiffness, in that direction. Reis and Lazarus aren’t the only scientists who are intrigued by the unusual properties of eggshells. There is a surprisingly long history of scientific studies of eggshells, not only in the agricultural sciences but also in the aerospace industry during the 1950s and 1960s, when the focus was on failure analysis of the metal shells used to build airplanes. Failure analysis is the study of how things break, exactly how and why brittle fracturing occurs when one drops a glass, or crashes an airplane—and eggshells’ resistance to shattering made them interesting to airplane engineers. Eggshells aren’t quite as brittle as glass or the metal shell of an airplane, because they are laced with organic material. Any given material gets its properties, like resistance to cracking, from its crystalline structure. Eggshell is similar to tooth enamel or seashells; all of these materials are made up primarily of calcium carbonate (calcite) crystals embedded within a protein matrix. It’s the latter that gives the shell its remarkable toughness, which is bolstered by a thin inner membrane made of collagen. Rather than splitting an eggshell in one clean break, cracks in an eggshell spread bit by bit, millimeter by millimeter. “Cracks propagate with great difficulty and the eggshell doesn’t shatter,” says Michelle Oyen, a materials scientist at Cambridge University. “The damage is very localized.” In that respect, an eggshell is nature’s perfect packaging. But not infallible. Science supports conventional chef wisdom when it comes to the optimal way to crack an egg without shattering the shell completely. There may be individual variations from cook to cook: Oyen personally favors a firm tap on a flat countertop. But it will always involve a single sharp smack—as opposed to a series of gentle taps, which are more likely to shatter the shell—against a hard surface or edge, targeting the center of the egg. For the one-handed technique, some chefs advise practicing with a golf ball until you get just the right feel for exactly how much pressure is required. No matter which technique you use, you should heed the advice of Sabrina’s persnickety instructor: Be merciful. A fast, clean break is best.